Home > Cockroaches > What are American Cockroaches? Throughout the world, there are more than 3,000 species of cockroaches. These insects are extremely adaptable, making them one of the most invasive pests imaginable. In the United States, the American cockroach is known for being one of the most popular of the 55 cockroach species found in the region due to its large population. American cockroaches can be identified based on certain characteristics which they exhibit at various stages of their development. Generally, adult American cockroaches are about an inch long, which makes them rather big when compared to other species. In addition, these cockroaches have a reddish-brown color and wings that fully cover their abdomens. Their thorax also features a slight alteration in color since this section of the American cockroach’s body is usually yellowish. The nymphs look very similar to adult cockroaches. However, American cockroach nymphs do not possess wings. They are also usually much smaller, measuring less than half inch in length, in most cases. Like their adult counterparts, they possess the same number of limbs, three pairs to be exact, a pair of antennae and often dwell in dark, moist places such as basements or landfills, in addition to crevices or spaces within home or commercial structures. Like many other insects, the life cycle of American cockroaches feature three stages: egg, nymph, and adult. The eggs are easy to identify. Female cockroaches lay eggs that have the appearance of a capsule. These are usually found in corners, along walls, or in other areas that provide suitable conditions. These capsules are less than half an inch in length and dark brown in color. Female adult American cockroaches can lay up to 90 egg capsules in their lifetime which could last for just about 15 months on average. Within egg capsules are developing nymphs. These nymphs may hatch around 50 days after the female American cockroach lays its egg then develop further during a nymphal period that lasts for at least 160 days. food and about a month without water. 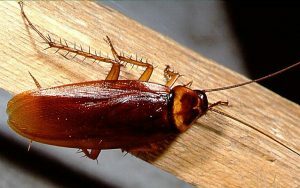 Cockroach excretions or cast skin in areas of infestation that include basement, kitchen, within closets or beneath sinks. 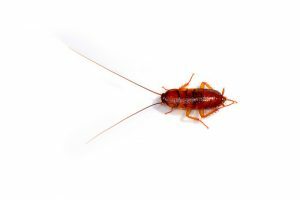 American cockroaches are best controlled through the use of both preventative and elimination procedures. Since these insects are very resilient, control measures must be implemented during regular intervals to reduce cockroach populations. Keep your home or business clean by employing the best sanitation practices. This includes regular removal of garbage or any other materials that may attract cockroaches. After all, a clean, clutter-free environment is less likely to appeal to these insects. Caulk cabinets, closets, and sinks, as well as crevices within walls and other structures to prevent cockroaches from finding dark spaces in which to dwell or travel. Improve food storage by ensuring food items are placed in sealed or airtight containers. Reduce moisture within homes by ensuring leaks are fixed. This will reduce the number of damp areas present and discourage cockroaches from breeding within your home or other buildings. Chemicals are readily available to combat American cockroach infestation. However, many cockroaches prove resistant to pesticides, especially if the same product is being applied on a regular basis. Improve the likelihood of eliminating American cockroaches by contacting a pest control expert or use solutions that include boric acid, abamectin or fipronil. Solutions that include boric acid in particular have proven highly effective in reducing cockroach populations when compared to insecticide sprays. These provide the best results when mixed with flour, sugar, and water before being used as a bait.